Left image courtesy of Sandra Lindstrom. Collection number SCL 15355 in the UBC Herbarium Algae Database; search the specimen in the database for more information, or search the species for more occurrences. Right photo by Jenn Burt. The gametophyte of this red alga is narrow (to 1.5 cm wide) and flattened, ranges from bright to very dark red, and has a soft and slippery texture. Branching, when it occurs, is in an approximately opposite fashion from the main axis. 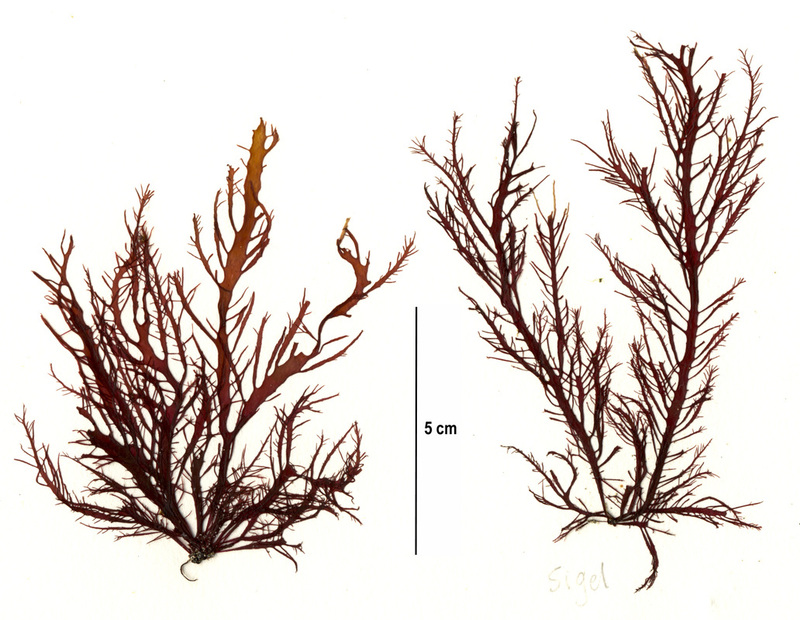 Branches and the main axis are fringed with small lateral branchlets, giving this seaweed a tattered, ragged appearance. It has a faint midrib and veins. While it can grow to 20 cm tall it is usually much shorter. This phase alternates with a crustose sporophyte found in the subtidal. 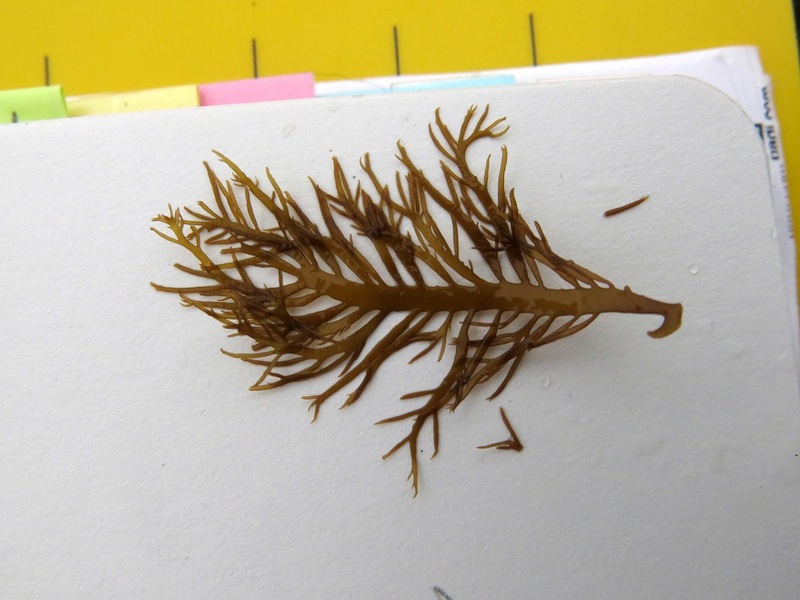 Farlow's seaweed grows on rock, often partially buried in sand, in the low intertidal and in tidepools in the mid-intertidal. It is found in exposed to semi-protected locations found along outer coastlines from central Alaska to Baja California, Mexico, and along Japan, Russia, and the Kuril Islands. Newer growth may be cylindrical instead of flattened. Lindberg, M. and Lindstrom, S. (2010). Farlowia mollis Farlow's seaweed. Seaweeds of Alaska. Accessed 21/04/2015. O'Clair, R. and Lindstrom, S. Farlowia mollis (Harvey et Bailey) Farlow et Setchell. In Klinkenberg, Brian. (Ed.). E-Flora BC: Electronic Atlas of the Plants of British Columbia. Lab for Advanced Spatial Analysis, Department of Geography, University of British Columbia, Vancouver. Accessed 21/04/2015.